Flip the 6th! 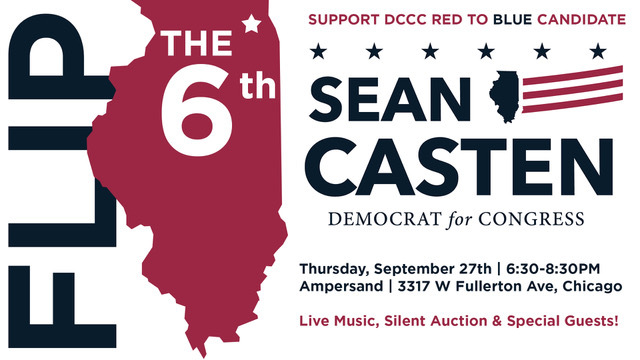 A fundraiser for Sean Casten! Music! Silent Auction! Special Guests! Please join host committee Mary Nisi, Carrie Weston, Sarah Frier, Aviva Bowen, Heidi and Jim Coudal, Clarissa Cutler and Jim Swinerton, Steve and Amy Waldon & We Are Prolog (Julie Honness & Ilana Manester) at Ampersand Cowork in Logan Square for a fundraiser benefiting Sean Casten for Congress (IL-6). We all live outside the 6th district, so we can’t vote for Sean, but we are doing what we can to support his bid for Congress so we can flip the seat—getting that much closer to a Democratic majority in 2018. Sean Casten is a scientist, advocate, and clean energy entrepreneur who has devoted his career to fighting global warming. According to Five Thirty-Eight, his opponent, Peter Roskam, votes 94.1% in line with President Trump's positions; last year, Roskam voted to repeal the Affordable Care Act and supported the controversial Tax Cuts and Jobs Act. He previously referred to climate change as "junk science.” We only need to flip 23 seats from red to blue, so come be a part of this much needed change.